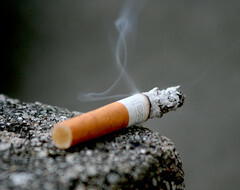 As of 1 July 2007, it is no longer legal in England to smoke in a public place that is enclosed or substantially enclosed. The ban covers anything that can be smoked; cigarettes, pipes, herbal cigarettes, etc. The definition of "substantially enclosed" is: "Premises are considered to be substantially enclosed if they have a ceiling or roof, but have an opening in the walls, which is less than half of the total areas of walls. The area of the opening does not include doors, windows or any other fittings that can be opened or shut." This category is for places which have a decent smoking area available, that is, an area that you would be willing to spend the duration of your visit in, given appropriate circumstances (e.g. good weather, the seats not all being already taken). So a pub with a beer garden or even just a couple of tables on the pavement outside would belong here. Comment added by Anonymous: seriously grateful for this info, thankyou! Last edited 2008-10-24 19:30:39 (version 5; diff). List all versions. Page last edited 2008-10-24 19:30:39 (version 5).